Mass media are, collectively, an effective mechanism for the engagement of the general public in a debate and exchange of information related to science and technology innovations. Whether the aim is to affect change at the individual, population, or policy-making level, public understanding of science and interaction between experts and lay audiences are paramount. This chapter describes a case study of a cybersecurity forum that provided an opportunity for information technology experts to share their knowledge with studio and social media audiences. 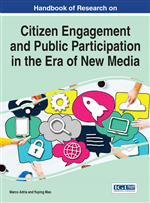 Reviewing conceptual and practical implications of the case study, the chapter discusses how public engagement efforts could capitalize on the strength of both traditional and online media and introduce interactive programs that cross these two media spaces. Cybersecurity is a critical concern for citizens, industry and government. Intrusions and attacks compromise everything from our personal identities to our national security, from our ATMs to financial markets. Although the risks associated with cyber attacks are real and often devastating, it is difficult to engage the public in messages that help them stay safe. To promote public engagement on the topic of cybersecurity, the University of Florida (through a partnership between the STEM Translational Communication Research program and the College of Engineering) organized a community forum on the topic of cybersecurity. The event, Ask SENSEI, was named for the activities of the SouthEasterN Security for Enterprise and Infrastructure (SENSEI), which is engaged in basic and applied research, designs robust cyber infrastructures to counter cyber threats, and educates the public on how they can protect themselves. Related to the five core topics, the experts who participated in the forum discussed the questions related to the threats of the Internet and cyber activity, security of personal devises, the intersection of security and household products, innovations in cybersecurity technologies, consumer safety concerns, and fraud protection. Science Communication: Strategic communication efforts that aim to present science and technology topics to the general public with the goal of addressing misinformation, informing decision-making, or encouraging public debate. Social Media Mining: The process of extracting and analyzing social media interactions to recognize meaningful patterns in individual and social behavior. Public Broadcasting Service (PBS): A U.S. non-profit broadcaster and provider of public television programs. PBS provides programming in fine arts, science, history, music, public affairs and interviews and is consistently ranked the most-trusted national institution in the U.S.
Mass Media: A diversified collection of media technologies that reach large audiences via print and broadcast (radio and television) channels. Interactivity: A feature of communication and information exchange that includes contingency of future messages based on past and present messages, functionally dynamic process of communication, and/or ability of information consumers to control the flow of information by engaging with it. Social media: Technology-mediated channels that allow individuals and companies create and share media content through evolving virtual communities and networks. Cybersecurity: A set of efforts to protect information systems from theft and unauthorized access to data and services the systems provide.